Please note that a ticket reservation handling charge of HK$12 per ticket (same for both adult and child) will be levied for any purchase via this website or Intercity Ticketing & Service Hotline. 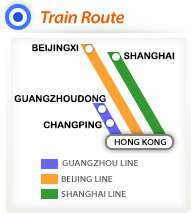 * Z803 runs from Guangzhoudong/Changping to Hung Hom; Z806 runs from Foshan to Hung Hom. Child tickets are for children aged 5 to 9 only. Passengers aged 10 or above should purchase adult tickets. A child under the age of 5 and accompanied by an adult with a valid ticket may travel for free, provided that the child does not occupy a seat.Tickets are valid only for the boarding station, train number and date as shown on the ticket.